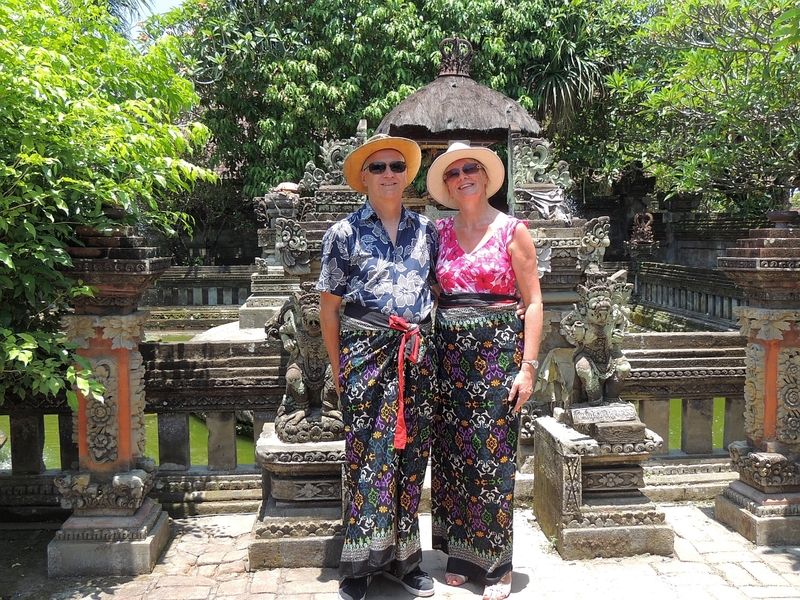 We are up at 7.00am as we are in Bali today and we are going on a tour organised by Alice, who Tam contacted through the Cruise Critic forum and we met at the get together earlier in the cruise. There will be 5 of us  me, Tam, Alice, Dave and Moira. We have breakfast in Blu before meeting up with the tour party in front of Café Al Bacio at 8.30am. 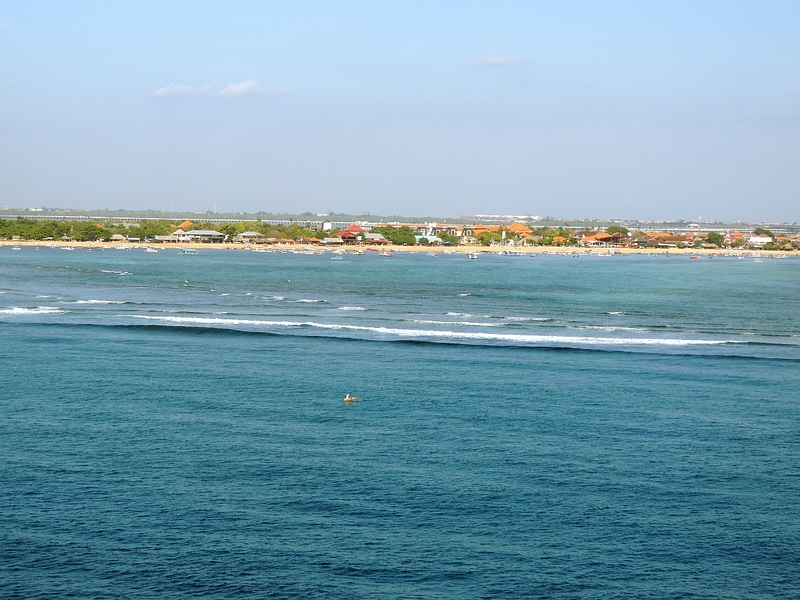 We are supposed to be anchored off Bali by 8.00am and cleared to tender by 9.00am. When I tell you that we are getting into our tour vehicle at 10.30am, you will understand the length of the whole tendering process and this is only because Alice got us tickets for the first non-ships tour tender to leave. 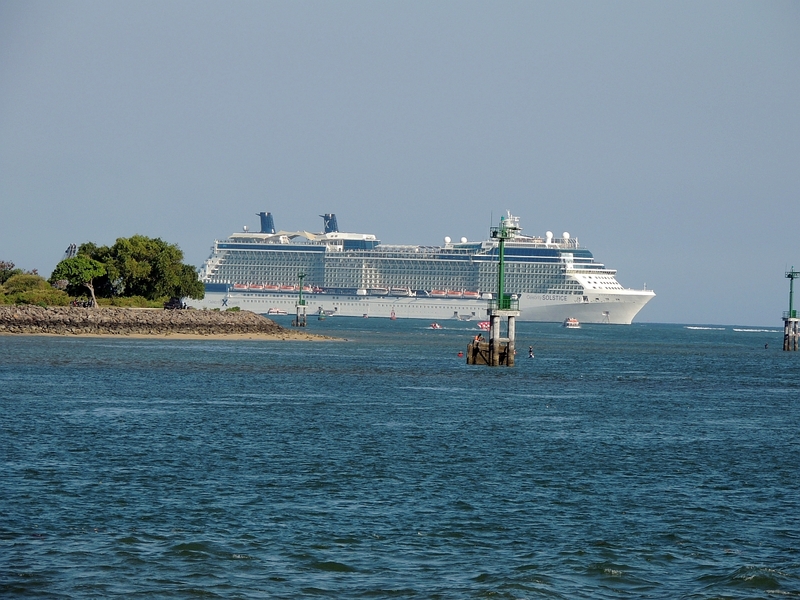 We have definitely found this a problem with the itinerary on this cruise; there is too little time in each port. As we leave the gates of the port at Benoa there are many taxi drivers trying to get you to use their services to tour the island, but we quickly find our guide, Dewa. By the way, Tam asks Alice if she has heard how the man who was pulled from the water unconscious while we were snorkelling in the Whitsundays is. Alice says she talked to him a couple of days ago. He was kept in hospital for a few days and rejoined the ship in Darwin. We leave the port of Benoa and head out on the packed roads. As well as cars and lorries there are hundreds of mopeds and scooters. 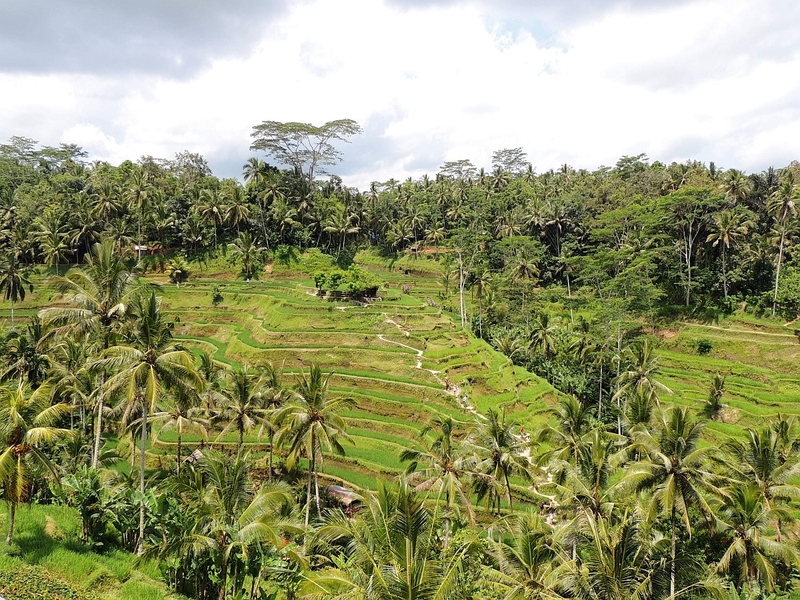 Dewa tells us many facts as we drive along such as that Bali is mostly Hindu and that they now have to import rice due to climate change  they previously grew enough on the island. 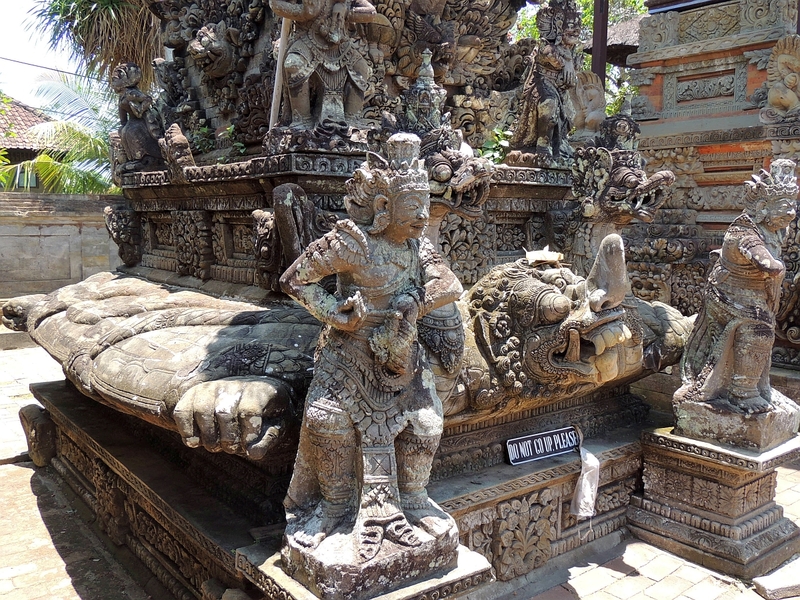 Bali is also known as the island of a thousand temples, I guess you can work out the reason for that one yourself. 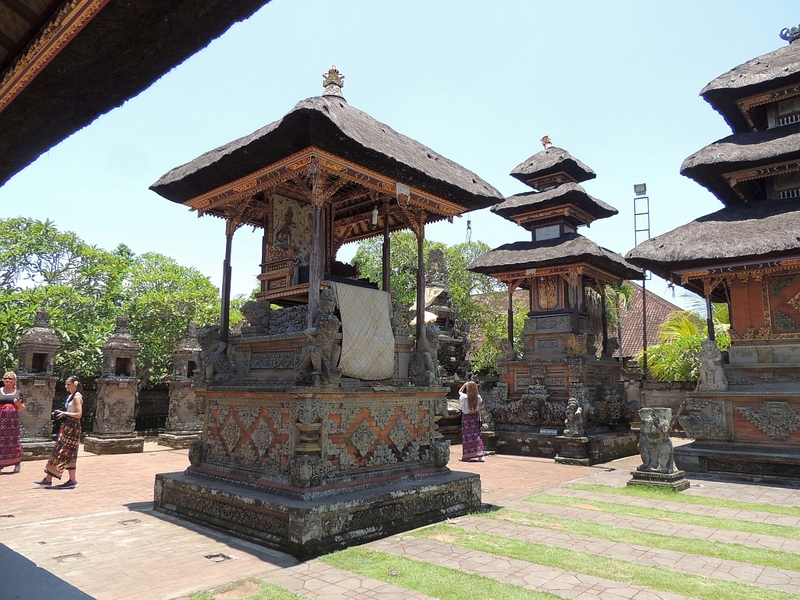 They also have their own Balinese calendar, which has 210 days. 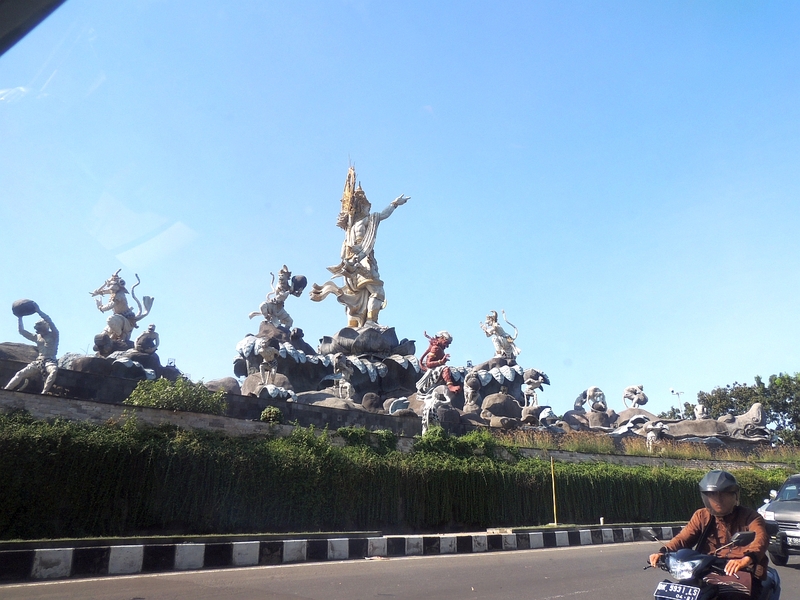 This makes Dewa over 75 in Balinese years, but 46 by the international calendar. Our first stop is at the temple in the village of Batuan. This is not a rural village. One of the things that has surprised me is that it has been quite built up along all the roads. I thought we would quickly get into rural areas once we left the port. 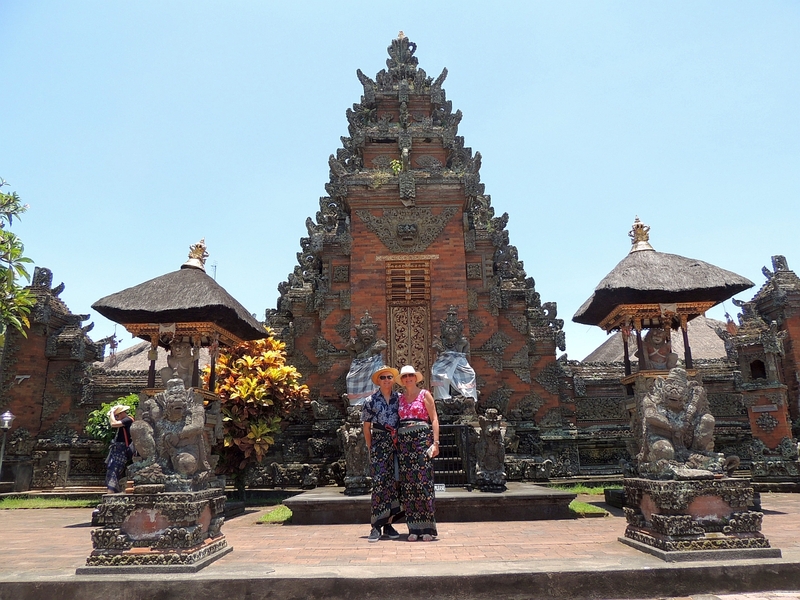 All men and women have to wear sarongs to enter the temple, which is a truly impressive place. 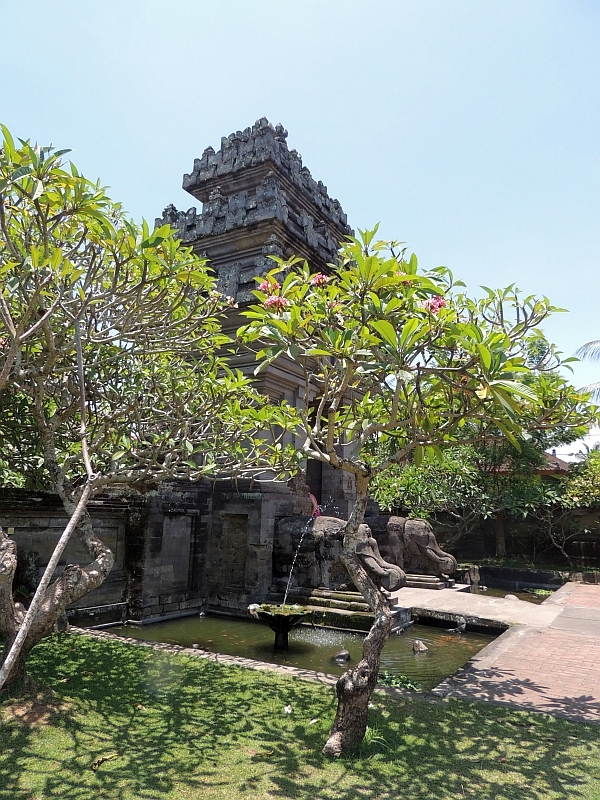 There isnt one main building, but many different structures around a courtyard dedicated to different gods. The intricacy of the stonework is amazing and parts of the temple date back to 944. 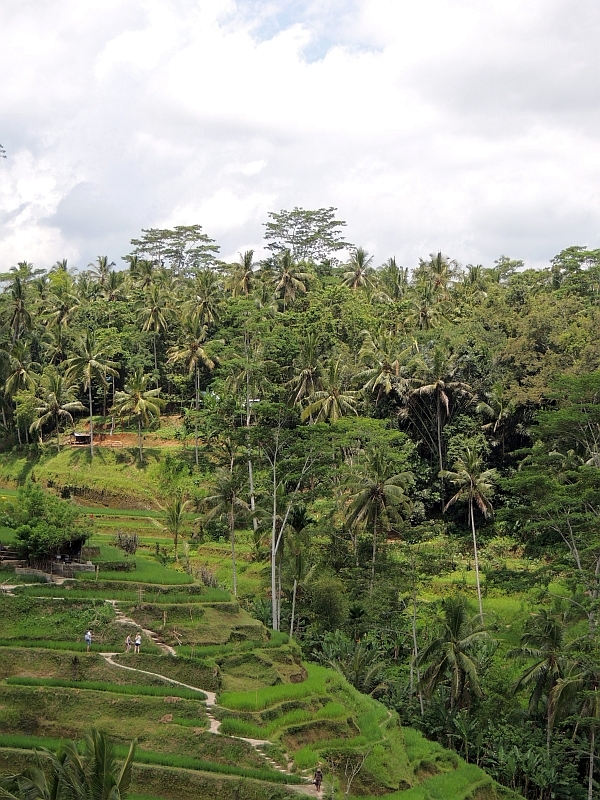 Our next stop is at a rice terrace. Again, its quite built up along the side of the road with loads of shops and small businesses, many selling stone carved figures and lots of woodwork as well. 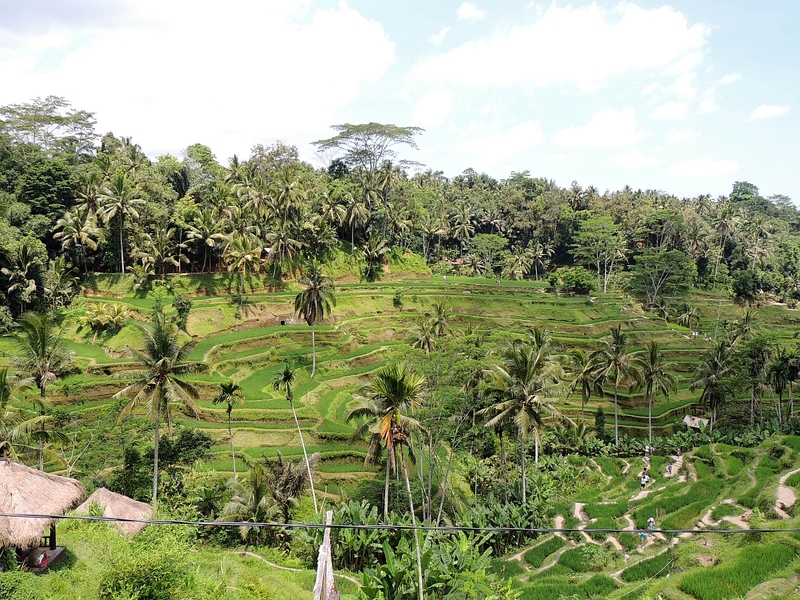 The rice terrace is very beautiful, although we do not have time to walk through it, just to look and take photos. A little way down the road we stop again for a coffee, but this is no ordinary coffee. 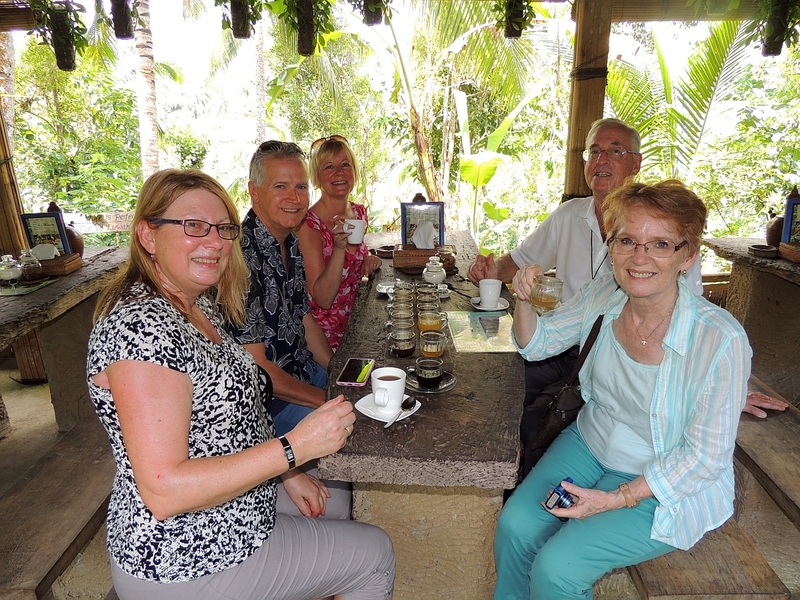 They sell Luwak coffee. I eventually realise that the Luwak is another name for a Civet cat. This is supposed to be the best coffee in the world. Basically they feed the Luwak with coffee beans, which pass through the cat whole. 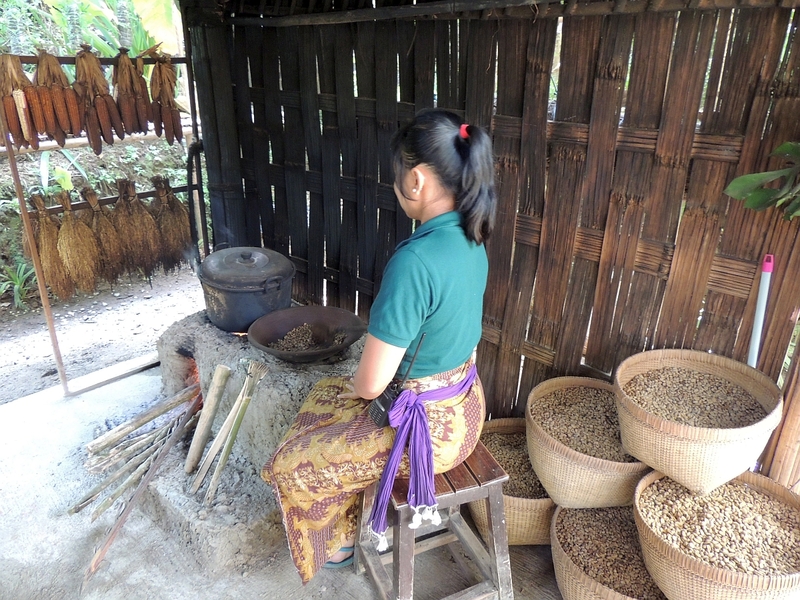 When they are excreted, they collect the beans, wash them, roast and grind them and make them into the coffee we know. Its cat poo coffee. A young chap explains the process to us and shows the coffee being made  luckily he misses out the poo collection part. 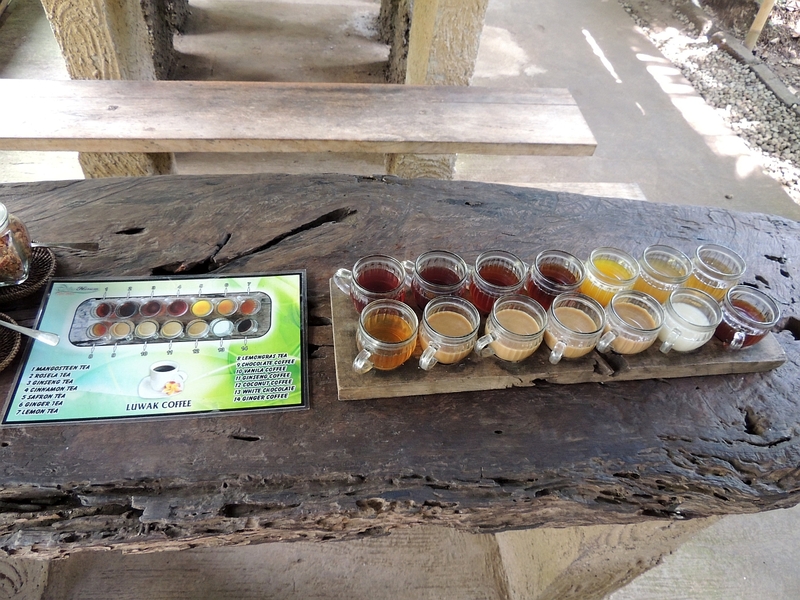 We get to try 10 different flavoured teas and coffees for free, but the Luwak coffee costs $5 (US). We try it and its very nice coffee, but Im not sure I could tell it apart from other good quality coffees. We now have a choice to stop for lunch or drive through the countryside some more. We all decide to pass on lunch. 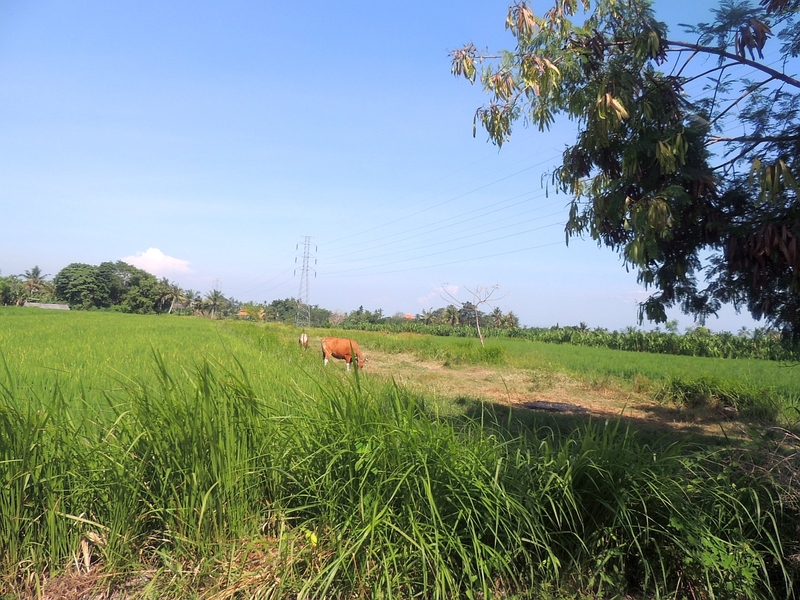 Im very glad we did as we drive through a much more rural landscape with many more small rice fields being tended. Unfortunately we have to head back to the port as the last tender is at 4.15pm. There are just too few hours to visit another temple or go any further into the mountains. We thank Dewa for showing us his island and tip generously as the cost for the whole day has been just $20 (US) per person for the 5 of us. At the entrance to the port there are lots of stalls selling the usual tourist type stuff, but Tam wants to get something for the girls, so we run the gauntlet of the sales people. Tam spies some colourful harem pants and the lady tells her they are $30 (US) a pair. Tam says no and the lady says we can haggle. Eventually Tam buys 3 pairs for $20 (US), even then I suspect the lady selling is very happy with the deal. The queue for the tender is quite long and it takes over an hour to get back on the ship as its quite rough and they struggle to get people off the tenders and onto the Solstice. Not only have we had just a few hours in port, but 2 ½ hours has been spent tendering or waiting to tender. Its certainly something I would pay careful attention to when thinking about booking future cruises. After the meal we walk to the World Class Bar where Rahadian makes me a Hawaiian Lava and Tam has a Tan Russian. Rahadian thanks me profusely for mentioning him and Loida on our comments card. Apparently he got called into the bosses office, congratulated and given a scratch card. He was hoping to win a car, but got some free phone time. I ask whether many people take the time to comment positively, but he says not. It just goes to show that you should take the time to praise those that have given you good service as it takes very little effort to mention them on the comments card they leave in your room. We go to the Sunset Bar next, where I have an Old Fashioned and Tam has the cocktail of the day, a Raspberry Lemonade. Its weird how they make the same cocktail differently at different bars as my Old Fashioned is made with bourbon, a splash of simple syrup, a muddled cherry and piece of orange and a splash of soda. We decide to get a glass of wine in Cellar Masters before the show. We ask Elina (the lady that took the Reidel wine tasting presentation) if they have La Crema Chardonnay, as we really like it. Unfortunately they only have it by the bottle, but she says they will keep the open bottle for us so we can have the rest tomorrow or have it sent to the restaurant of our choice. She goes off to find the price - $58 (US). Thats a bit much, especially when we can drink for free on our premium package, but she says we can have it for 20% off to take the price to $46 and we can use the Reidel glasses as long as we dont take them from the room. The fact that I have already had a few drinks is probably a factor in my decision, but we decide to go for it. It really is a very nice wine and I ask Elina if they have any cheese to accompany it. She tells us that they sometimes have tapas style bits and pieces, but not tonight. We are enjoying our wine when Elina reappears with a plate. Shes been over to the Murano restaurant to steal a bit of their cheese for us. Once again a Celebrity member of staff has excelled beyond what is normally expected. I get another glass of wine (not in the Reidel glass) and we head to the Solstice Theatre where Ashley Amber Smith is already belting it out. Ashley is an attractive black lady with an ample bosom and a very small low cut top on. And we are in the balcony looking down on her. I mention these facts only because there must be an opportunity for more Brown Booby jokes if only I were brave enough. Ashley is the lady that did the Witney Houston tribute a few nights ago and Im hoping we dont get any more of that as Im all Whitneyed out. Unfortunately her last song is exactly that and I make a hasty visit to the toilet to escape it. The second half of the show is the Filipino X Factor runner up from last night. Both ladies are good, but Ive had my share of divas singing for one cruise thank you very much. Back to the World Class Bar where I have a margarita and then we go and stand and look down into the foyer where a DJ is playing hits from the 50s, 60s and 70s. This seems quite popular, as there are a lot of people dancing. As the evening wears on the crowd thins out. 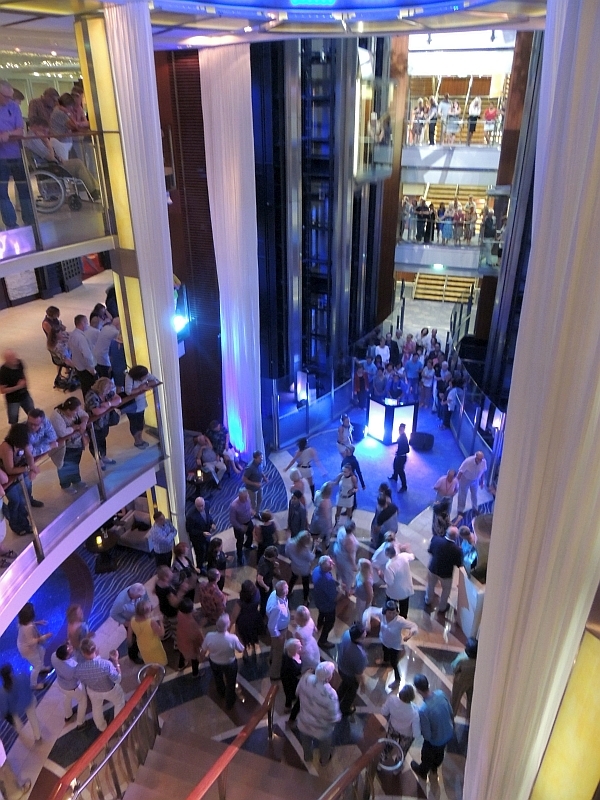 The Solstice really isnt a late night ship, at least on this cruise. We retreat to Café Al Bacio for a coffee and to look down on the dance floor. As there are less and less people, Tam and I have a bet on who will be the last one left. My money is on an Asian lady who seems to be having a good time and Tam has placed her faith in a lady in a red dress, who looks very enthusiastic. Come on Asian lady, you can do it! A short while later we look down and the floor is completely empty apart from the Asian lady who is giving it large. Woohoo! Good on you madam. Just as we are finishing our coffee, guess what the DJ plays? Yep, Whitney chuffin Houston. It is most definitely time for bed.